So I woke up early this morning to do something very, very exciting. Now, what would be so thrilling to make me wake up early on a Saturday morning in August? I went to watch a person declare that he is running for Mayor of Toledo. If you follow this blog, you know that I’m a lover of politics. And right now, due to the untimely passing of Mayor Collins, we are in what amounts to a bonus round for political nerds like myself. Add to this the wild Presidential Primary Season, and I’m in my glory! While I am currently torn between Carty and one other candidate in the race, here is why I like and respect Mayor Finkbeiner: no one person is responsible for civic pride in the community. No one person is able to click their fingers and make a community better. No one person has a magic wand to brainwash the citizens into believing in a better tomorrow. Yet, one person is responsible for igniting passion. One person is responsible for being a City’s biggest cheerleader. One person is responsible for holding government— and the people— accountable. And that person is the Mayor. I’ve never seen a political leader fulfill those duties the way Carty Finkbeiner has. When he occupied the 22nd floor of One Government Center, this City seemed to be full of civic pride. It was because our Mayor projected that. Just look at that photo above— Toledo through-and-through. Yes, Carty has had a few (or a lot) of gaffes in his time in the public spotlight. Citizen’s arrest. Deaf people at the airport. War with the Insane Clown Posse. Those are just a few that come to mind…. But, as it should be, the positives outweigh the negatives. Carty’s attitude is what this City needs. 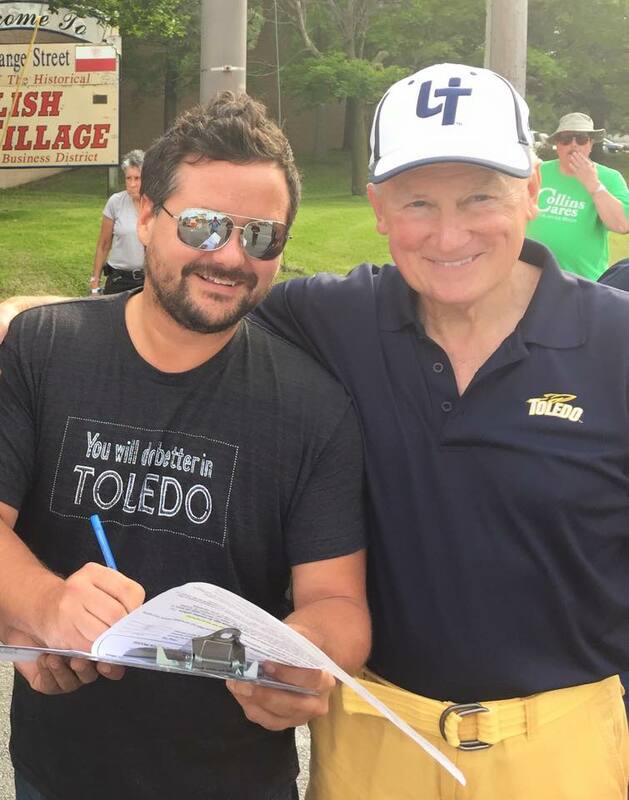 If another candidate can match the fearless pride that Carty Finkbeiner has in Toledo, Ohio, then they should step up to the plate and have a serious discussion on plans and policies. But the energy is what comes first… and so far, Carty has the advantage. Thanks for reading! Please go pick up a copy of my book, The Trashy Hootenanny, today on Amazon! I love Caitlyn Jenner. There. I said it. Never have I ever been a fan of The Kardashians. I don’t keep up with them. I can’t stomach Kris. But Caitlyn is a different story. I like her humor. 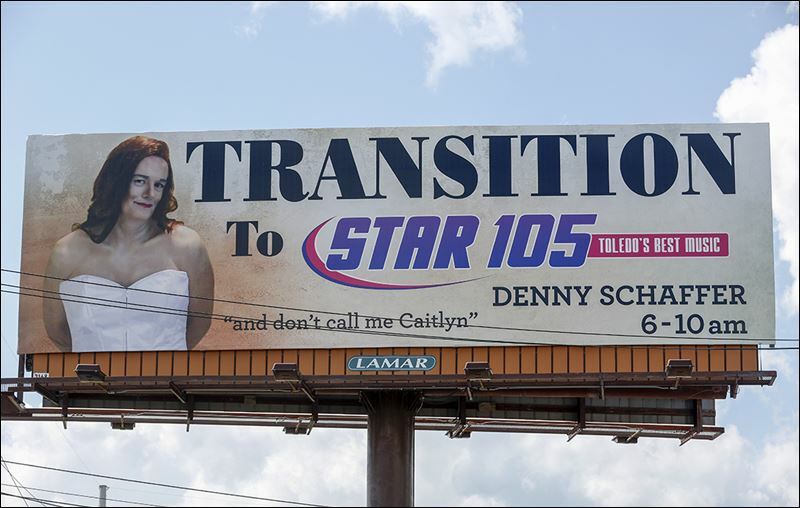 I like the fact that she is choosing to help younger transgender people by telling her story in a responsible way. And I love the fact that, even in her 60’s, she had the courage to become who she truly is. I’ve learned so much and gained such respect for the transgender community from her reality show. Those that spoke out when Caitlyn received the Arthur Ashe Courage Award at the ESPYs were wrong. Are there other acts of courage that might be more courageous than stepping out as a transgender person? Of course. Is she still courageous for doing this? Is she still a hero? You ask that question to a transgender teen that has contemplated suicide. 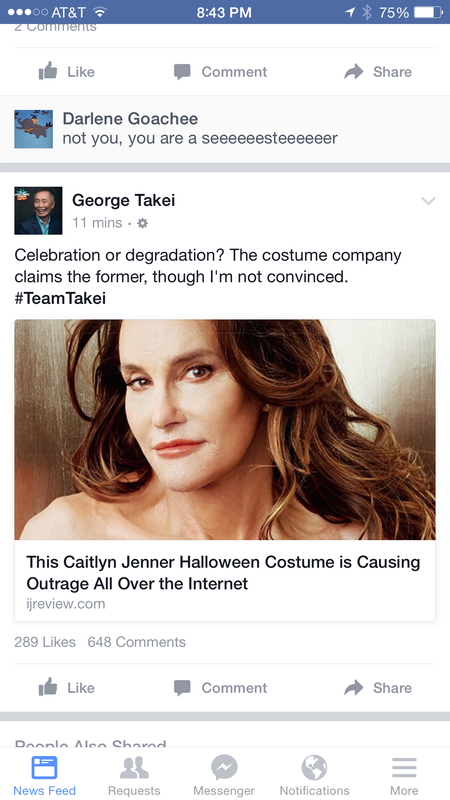 I am convinced, Mr. Takei. Name me a pop culture phenomenon that hasn’t been replicated come Halloween time. Do you know how many little Donald Trumps, complete with fish lips and combovers, are going to be running around this October? 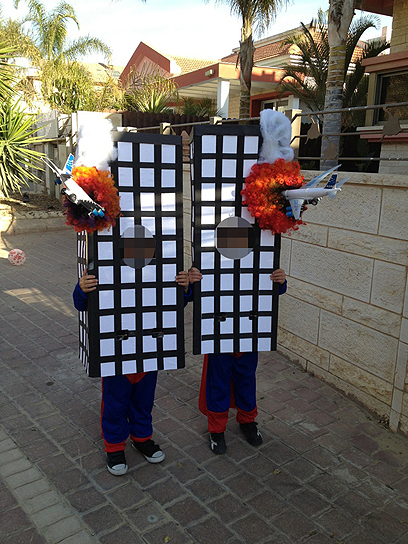 Is the controversy about the costume itself or the fact that a company is producing it? I’m sure there will be much better homemade Caitlyns at Halloween. Can I see how someone could be offended by this? Sure, I can. I have a nuanced opinion about lots of things that could or should be offensive. 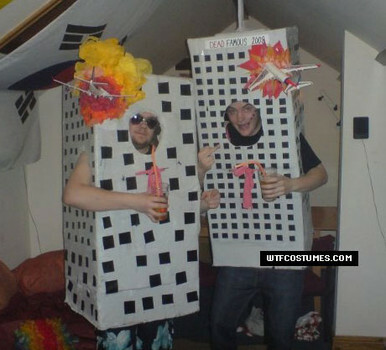 On the other hand, I have a whole world of friends that could wear this costume and pull it off. Friends that are supportive and understanding and funny. Not judgy. I like Caitlyn. I support Caitlyn. 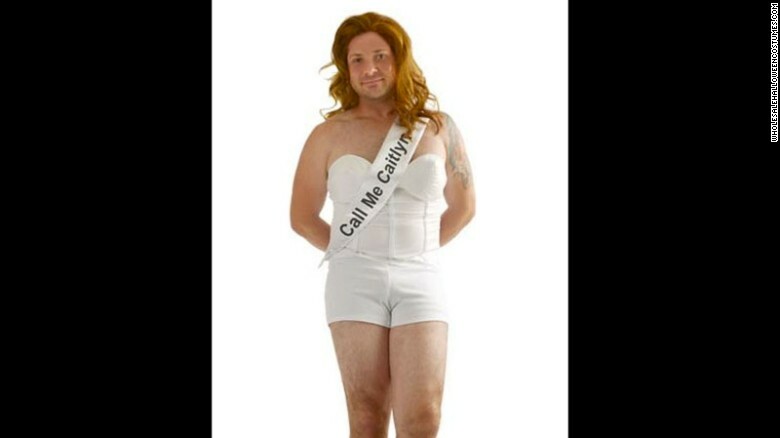 But I think even Caitlyn would have a little giggle at seeing grown men walk around dressed like her Vanity Fair cover. Folks, this is offensive. Particularly the kids. Some parent thought this was acceptable. Next time, before we get all up-in-arms about being offended, let’s take a deep breath and put things in perspective. Thanks for visiting this blog! Go give us a LIKE on Facebook at Pete the Popcorn! Coming Home for Bullying Prevention Month Events! As you all know, we’ve been traveling the country on our Encouragement Across America Tour. But we want to give something back to the area that launched Pete the Popcorn. So, we are heading back to the Toledo/Detroit area for a slew of events next week, a few of which are open to the public. First, we will be at Memorial Elementary in Garden City, Michigan for a Family Reading Night Event on Monday, October 8th at 6:30 PM. Then, we will be holding our very first public READING event in Toledo, Ohio on Tuesday, October 9th at 6:30 PM. This event is open to the public and you can register for it by clicking this link. Finally, we will be in Ypsilanti, Michigan for a Family Reading Night event on Wednesday, October 10th at 6:30 PM. This event is open to the public and all you need to do is show up! The location is Brick Elementary School, 8970 Whittaker Road, Ypsilanti Township, MI 48197. We surely hope to see some of our great supporters at these events next week.